Gin Yut Ching, photo, form M 143; Chinese Exclusion Act case files, RG 85, National Archives-Seattle, Gun Yut Ching, Box 833, Case 7031/39. Gin Yut Ching was born on 1 August 1930, 4:30 a.m. on SS President Jackson, Voyage 24-E, latitude: 42-13 N, longitude: 155-45 E. Arrived in Seattle, Wash. on 9 August 1930; address: 2245 Wentworth Ave.; certificate of identity 64172. Gin Yut Ching, birth report 1930; Chinese Exclusion Act case files, RG 85, National Archives-Seattle, Gun Yut Ching, Box 833, Case 7031/39. 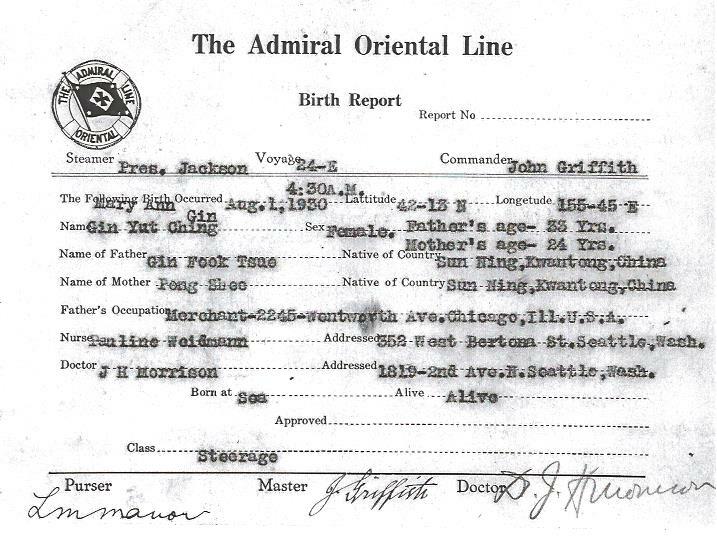 Gin Yut Ching, daughter of Gin Fook Tsue, merchant at 2245 Wentworth Ave., Chicago, Ill; mother: Pong Shee. Parents were from Sun Ning, Kwantong, China. The nurse attending the birth was Pauline Weidmann, 352 West Bertona St., Seattle, Wash.; doctor: J. H. Morrison, 1819 2nd Ave. N., Seattle, Wash.